The mic was off. “Thanks for coming,” I said. “That was great.” And everyone in the room agreed. “Tuesday. I’m freaking out,” she said. “Wait. Why?” I was confused. We just did an hour long podcast about confidence. The podcast was back on. 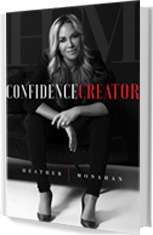 I was talking to Heather Monahan, author of “Confidence Creator,” which just came out this week. I thought we had a great conversation. I learned a lot. But more on that later. I wanted to know what she was afraid of. It’s her first book. And to me, that means, one thing: opportunity. She told me some of fears. I started to tackle each one. “That’ll never happen because they need to prove X.” “And no, you don’t have to even think about that because of Y.” And my friend, Bill Beteet, who’s a lawyer turned comedian was in the room. And he agreed. I checked the time and she left. I just spend the last hour playing devil’s advocate with her. She was the positive one telling me how to create confidence. And I was the challenger. Because she made it sound easy. Confidence isn’t easy. Confidence isn’t easy. I know this because I don’t have any. These were the questions I asked. And I learned a lot. I learned that I think I’ll be a little more confident if I just take a few steps in the right direction. She told me about her low moments. Getting fired as Chief Revenue Officer because someone else didn’t like her personality. Getting divorced and questioning herself, her choices, who she is as a person. And she’s right. The reason she bounced back from those low moments was because she decided to. You don’t just bounce back by mistake. So when I asked her to walk me through step one. She made it clear: decide. Decide if confidence is something you’re willing to work on. One of the ways she does this is with a 30-day plan. “What does that look like?” I asked. She told me about her son who broke his leg playing basketball. He was devastated because he’d have to be out of the game for a while. But instead of allowing it to be some unknown amount of time, Heather helped him create a 30-day calendar. “I like to give myself that sense of, ‘Okay, I can get through today,’” she said. So they cross off each day. They showed themselves that they made it through and that they were keeping their sites on the bigger goal of getting back on the court. Getting back to the parts of life that they like. Heather also did the 30-day plan trick when she got fired from her job. She made a priorities list each day. She asked herself, “What do I WANT to focus on.” Key word: want. Not need. That’s so important. Because if she only did what she needed to, she might still be suffering. Doing what she wanted, making a list of it, and checking off each day helped her get out of sadness. And into confidence. But she also didn’t let herself get trapped. So when I asked how long someone can be sad for, she talked about vision. So the first 30 days after getting fired, after getting divorced and so on, Heather dedicates to just getting through the day. She set her priorities and goes down the list. But after that, she makes a new plan. And it doesn’t have to be exact. 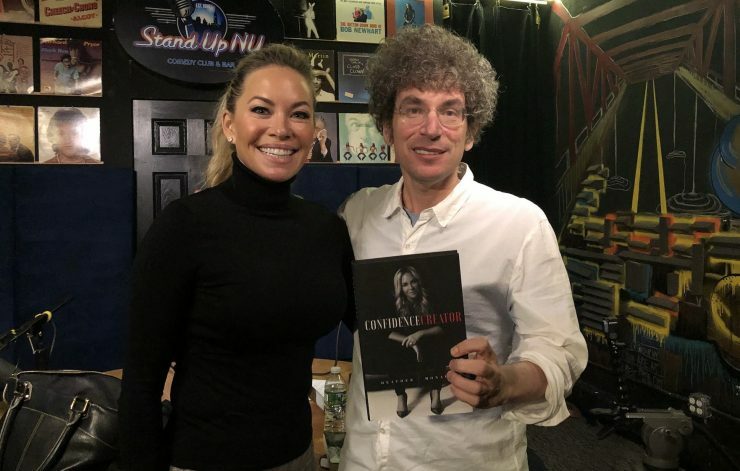 She didn’t know the name for her book or even what it was going to be about. She even made a mock-book one day just to push herself a little closer to the direction she wanted to be. I think the reason so many people feel like their confidence is static is because we forget to move past 30 days. Something tragic happens, we either bounce back or we don’t. And wherever we land usually ends up being our new status quo. But Heather showed me it doesn’t have to be. I can make a new plan any day. And I don’t even have to believe in it. I can just fake it until it comes true. I asked Heather this because often, I find that when there’s some obstacle in my life and I feel like it’s blocking me, I ruminate on it. So instead of focussing on where the opportunities are, I’m focussed on all the negatives. And this rumination leads to anxiety and lack of confidence. Then I find myself trying to solve my hardest problems with my worst mindset. Everyone advocates using a gratitude journal, but that’s because it must work. She gave an example. It was simple. Someone carried her suitcase up the stairs for her on the way up to the recording studio. And she felt grateful for that. And she feels it within a week. One week of just writing down 3 special things a day takes her out of rumination and all its aftermath. It’s almost like rewiring your brain to focus the gratitude instead of whatever I’m making up to be a big deal. Because, ultimately, nothing is so important that I need to destroy my sense of safety and security over it. I was listing all her techniques one after the other. She has so many. And they each have a purpose. So I wondered what’s her favorite. And she told me about dating a cop. One month later, she was attacked. It worked. The dog ran home. But then, when she looked back, she realized it was a lesson on standing up for yourself. Because she faced bullies before getting fired. There are bullies in schools and online and in corporate situations. I’m glad she said this. Because it really shows that choosing yourself is so hard. It’s not like we get to choose who the boss hires and who else we work with at all times. Some parts of life require different skills. And that’s why getting a book like this can help so much. Because you can turn to it over and over again. It’s not a one time read. And it can be applied to all levels of confidence: professional confidence, personal confidence, relationship confidence. I want to end this article with something new. I hope you tell me what type of confidence you think you can build the most. I’m going to start with self-confidence. How about you?